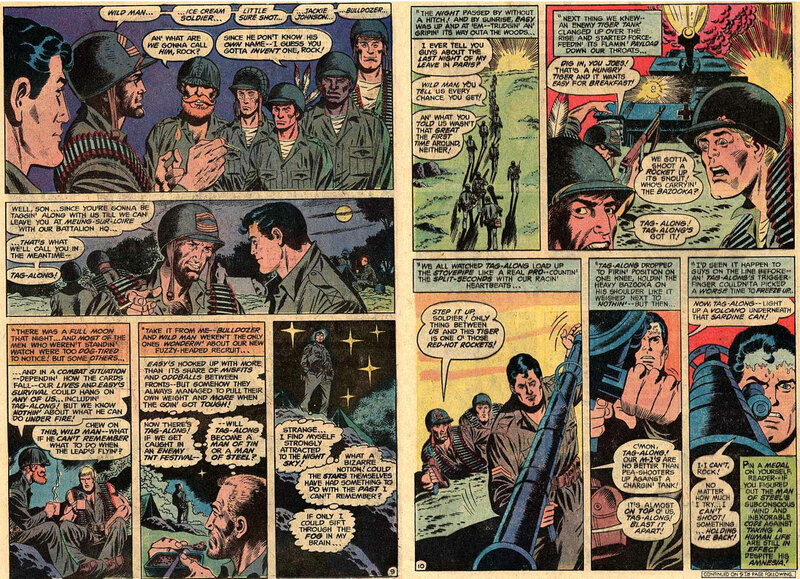 Comics have a grand history of featuring America’s fighting forces, going back to the medium’s earliest days to more recent, rebooted war titles. I read a bunch of these growing up, and still have a soft spot for the genre, particularly DC’s books. 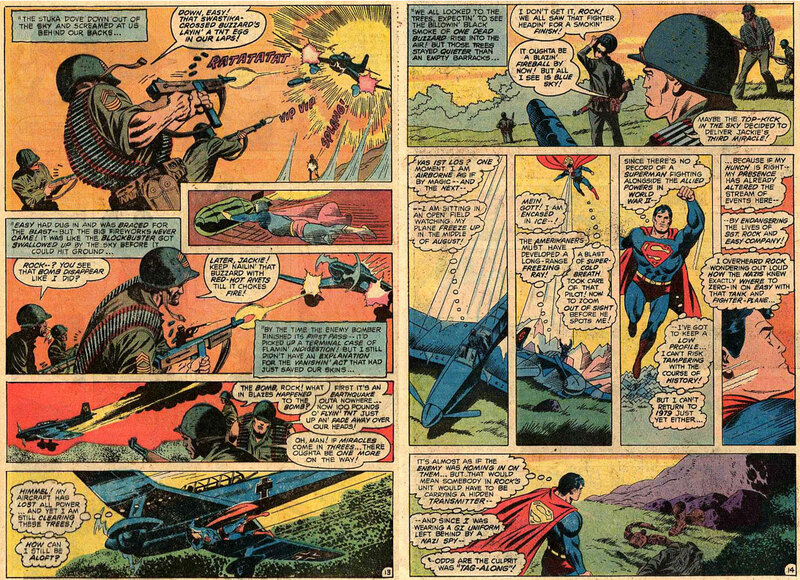 Enemy Ace, The Unknown Soldier, Weird War Tales — I ate all that stuff up. 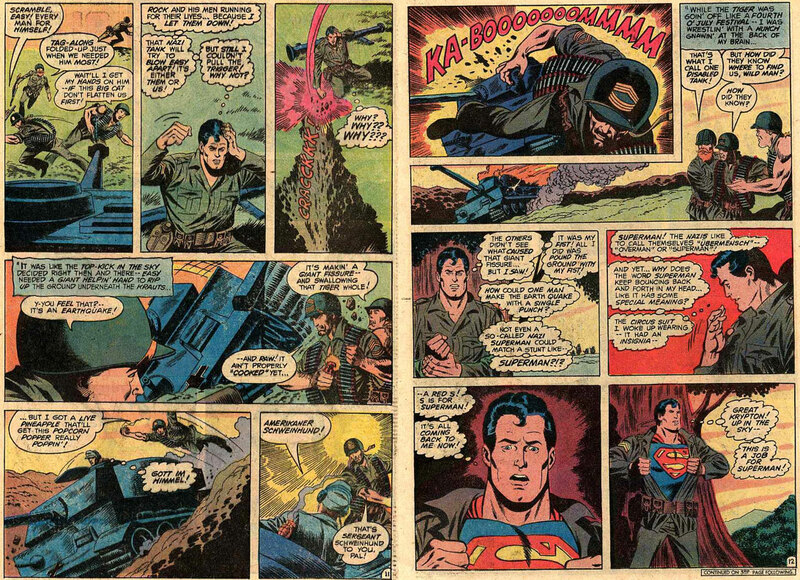 My favorite, though — without question — was Sgt. Rock. Slogging through World War II Europe, Sgt. 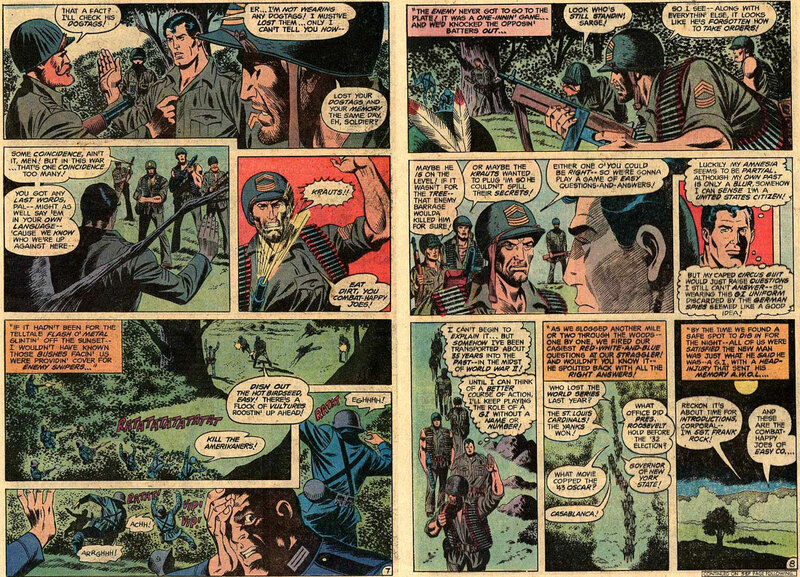 Rock and Easy Co. had that war-weariness you imagine every soldier reaches after enough time on the front lines. 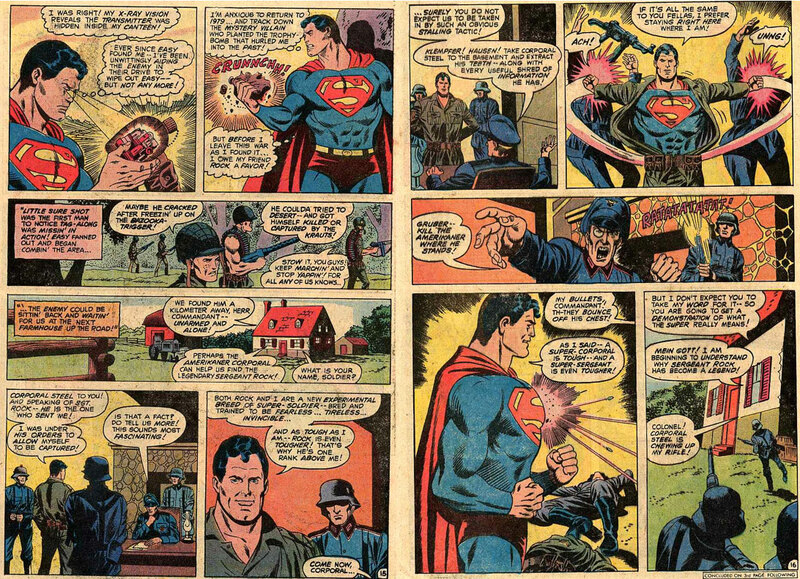 And while they fought heroically, selflessly — like their flashier super-powered cousins in the rest of the DC Universe — they did something else. They died. Most of the core characters would survive from issue to issue, but it was never a sure bet. Reading Sgt. 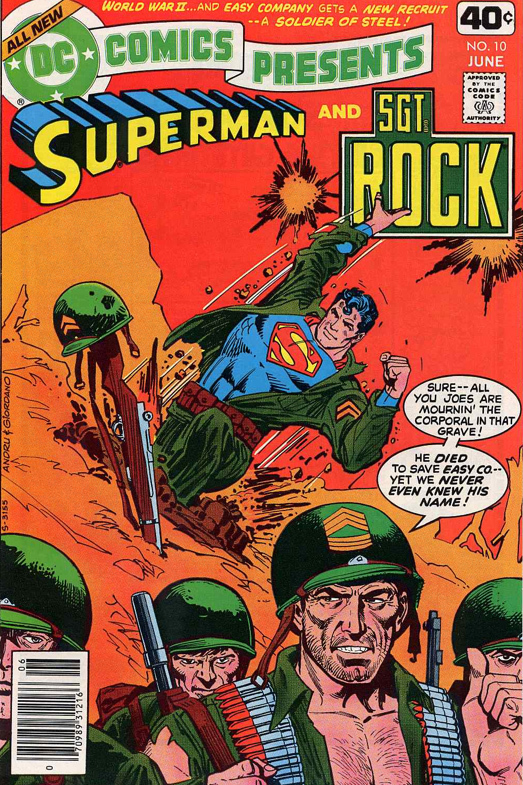 Rock meant knowing that war isn’t fair, and no one was safe. 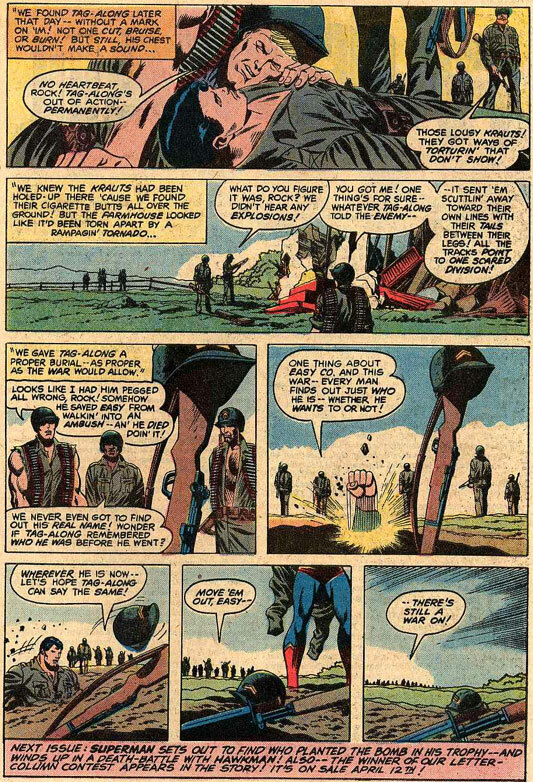 Add to that Joe Kubert’s gritty, you-are-there artwork and you’ve got a compelling, sometimes harrowing, war comic. 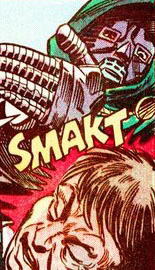 Of course, the title would sometimes dip into the superhero silliness of the main DCU. Because how else would Sgt. Rock meet Superman? Heck, it would probably take a bomb hidden in a French award, time travel, amnesia, and some good ol’ fashioned Nazi-fightin’ to make that work. 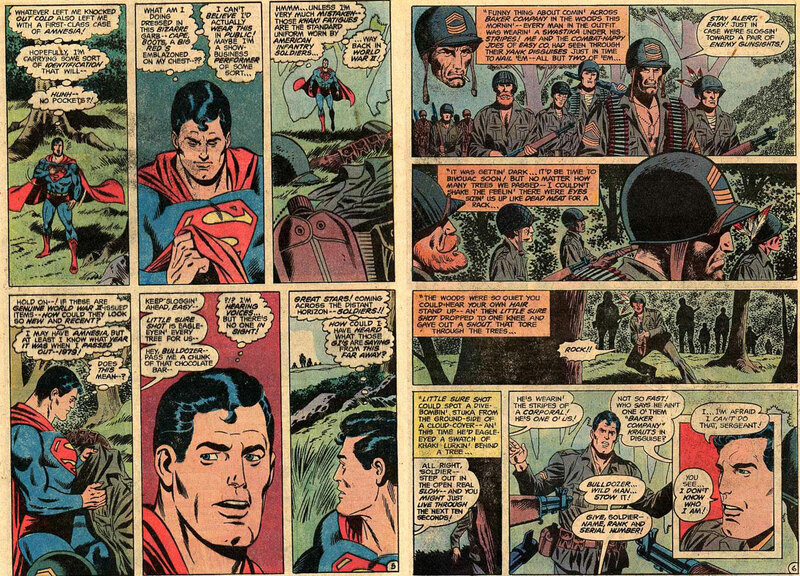 Luckily, writer Cary Bates and penciller Joe Staton put all that (and more) together for DC Comics Presents #10, in a story called “The Miracle Man of Easy Company” — enjoy, and happy Memorial Day! So who planted the bomb ? Now I want to know. Brace yourself for disappointment, Subzero (and please have patience if any of this is inaccurate – I’m working off memory). The person who planted the bomb was … some guy. 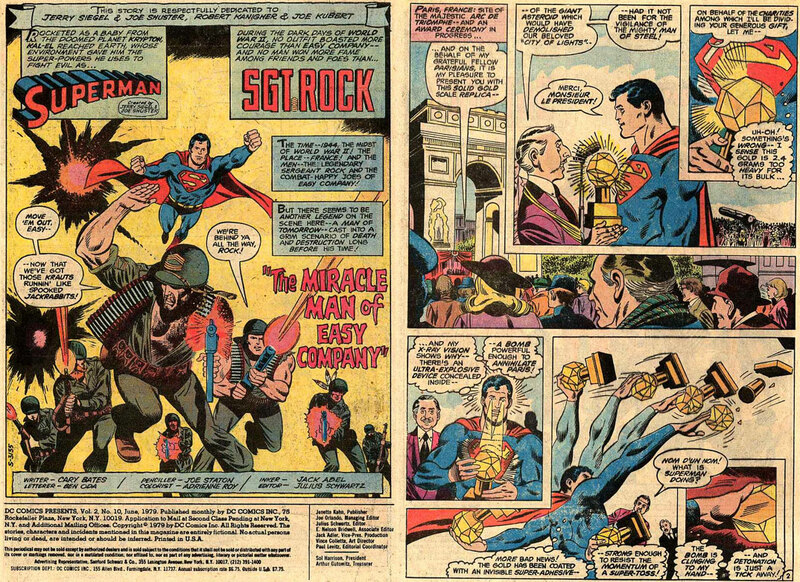 The following issue features Hawkman, who was in the Parisien crowd when Superman was getting his award-slash-bomb. 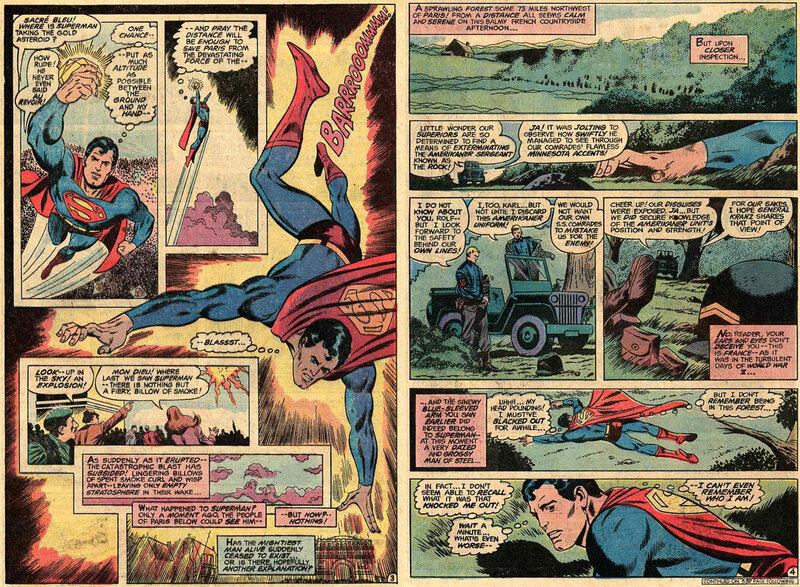 Superman goes to talk to him, but Hawkman acts as if he doesn’t know him and flies off. As the story goes on, it turns out that the bad guy’s dead brother was a friend of Hawkman, and discovered that the radiation from Polaris (the star) would give Hawkman powers on a near-par with Superman. So the bomb was a test of some kind. I think? 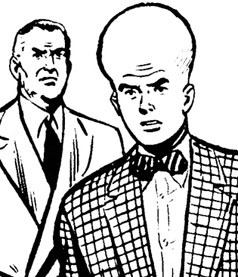 I’ll confirm that when I can refer to the actual copy of the comic. Anyway, the radiation also makes Hawkman a mind-slave and radiologically unstable to the point of city-destroying explosiveness, which the bad guy wants because he hates Hawkman because he put him in jail once. Also, there’s a sparrow that tries to keep up with Superman throughout the entire issue so it can deliver a message from Hawkman, and it’s adorable.